POST UPDATE: 4/5/2016: See Post Screening Q&A with Director Roger Sherman & Host Michael Solomonov in T&T's Docs Round Up Post! More Film & Food in Philly! Philadelphia Jewish Film Festival kicks off its CineMonday series at the Gershman Y with the Philadelphia Premiere of In Search of Israeli Cuisine, a mouth-watering documentary that follows Michael Solomonov, the James Beard award-winning chef and Philadelphia Restaurateur of Zahav (237 St James Pl, Philadelphia, PA 19106, adjacent to Ritz 5) as he returns to his homeland to discuss his culinary heritage. The screening will be followed by a conversation with local celebrity chef and restaurateur Michael Solomonov and Director Roger Sherman. Sierra Tishgart, Senior Editor of New York Magazine's Grub Street will moderate. After the talk, Michael Solomonov will be signing his Zahav cookbook. 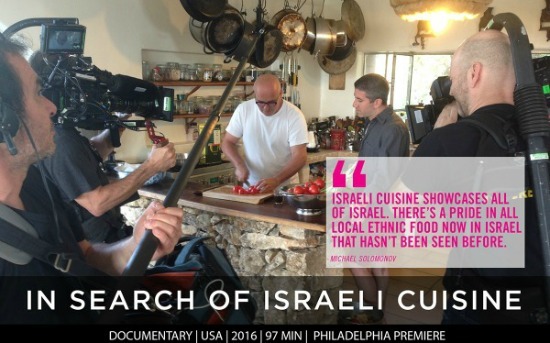 Tinsel & Tine has a limited number of tickets to giveaway for "In Search of Isreali Cuisine" #PJFFCineMondays, but tickets are still available for purchase BUY TICKETS or sign up through the facebook page. More On The Film: Is there truly such a thing as Israeli cuisine? Michael Solomonov, the James Beard award-winning chef and restaurateur behind top Philadelphia dining establishments Zahav, Abe Fisher, Dizengoff, Federal Donuts, and Percy Street Barbecue, makes it his mission to find out. In what is clearly a labor of love, Solomonov travels the length and breadth of Israel, meeting with an eclectic group of professional and amateur chefs, cheese makers, vintners, farmers, and fisherman, who draw on their own ethnic heritage as they add to the ever-growing lexicon of Israeli cuisine. As Solomonov immerses himself in the local flavors of the 100+ cultures that make up the Israeli people, Oscar-nominated documentarian Roger Sherman offers a behind-the-scenes look at a dynamic Israeli food scene rooted in centuries-old tradition. Monday, May 23 - Closing Night Film Princess Shaw. The Philadelphia Jewish Film Festival is a signature program of the Gershman Y. The second longest-running series of its kind in the United States and Philadelphia’s first film festival, PJFF uses film as a vehicle for exploring Jewish values, culture, and community. In its 35-year history, the critically-acclaimed PJFF has presented over 500 international films that highlight the diversity and commonality of the human experience, bringing together audiences with different perspectives and ideologies to explore universal themes and values that deepen our understanding of ourselves and society at large.